Free initial consultation & fitness assessment. Establish your goals and abilities. Our business has been changing clients lives for the better since 2004. We firmly believe our role is to encourage and inspire you to become personally responsible for your health, fitness and wellbeing. We treat you as you want to be treated : grown up! We offer sensible advice and provide first class service to all our clientele. Whilst many other types of training have sprung up in the market place we maintain our belief that 1-2-1 personal training truly makes a difference to many people out there. At eKuiLibriuM we understand the realities of life. We offer common sense, practical, functional fitness advice. Our programmes are designed to be fun and effective whilst taking into account your abilities, desires and goals. If you are tired of ‘normal’ gym environments or over-filled church hall classes where there is no relationship our mobile service is what you need now. We guarantee: no mirrors; no queues; friendly & professional customer service. We have in excess of 20,000 personal training hours under our belts and this experience brings the best fitness training to you on your doorstep. More importantly we believe that in the long-term, your fitness should be your responsibility and we teach you how to exercise with confidence. We will encourage you to create a fitness routine outside of your personal training sessions and expect you to commit to a minimum of 30 minutes of additional activity each day. We can’t wave a magic wand so for your goals to become a reality you have to expect to put in some effort! Our ethos is about creating positive routines and habits – a training programme with eKuiLibriuM is an excellent step in the right direction. WHAT TYPE OF PEOPLE WORK WITH AN eKuiLibriuM PERSONAL TRAINER? All types! From business people to housewives, new mums, retirees, athletes, prospective marathon runners, those who haven’t exercised in years and people who exercise regularly but want added focus. You certainly don’t have to be a celebrity to work with a Personal Trainer from eKuiLibriuM. And even if we had a “celeb” we wouldn’t tell you, as we respect client confidentiality. WHAT HAPPENS WHEN I MEET MY eKuiLibriuM TRAINER FOR THE FIRST TIME? WILL I EXERCISE? 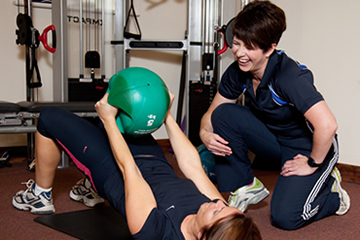 We carry out a full complimentary client consultation & static fitness tests. This hour-long session is your opportunity to get to know us, set yourself some goals and ask any questions you may have. You generally don’t exercise at this initial meeting but will leave with valuable information regarding your current levels of health & fitness. We do however like to get your ‘fitness MOT’ session in the diary to give you something to look forward to. Your ‘fitness MOT’ session involves active fitness tests during which you will get a bit hot and sweaty! It is designed to leave you feeling invigorated and motivated and at the end we will ask you to consider which of our block booking schemes you would like to enrol on. You can then book your designated weekly/twice weekly slot and at this point we ask you to make the appropriate payment. WHAT SHOULD I EXPECT IN MY PERSONAL TRAINING SESSION? No two sessions will ever be the same, and you will never know quite what to expect. Be prepared to get a little bit hot and have a lot of fun! HOW MANY SESSIONS SHOULD I EXPECT TO HAVE WITH MY PERSONAL TRAINER? Again this is entirely dependent on your goals. Sometimes clients work with us to give their fitness a kick-start and have just 10 sessions – 1 a week for 10 weeks to ease them back in. Some clients see us twice a week and have been doing so for years. Other clients may have a pressing goal – e.g.to fit into a size X wedding dress in X weeks. Obviously we’d love to work with you forever but we are realists and our job is to motivate you to reach your targets and help you make fitness an integral part of your life. After your ‘fitness MOT’ we do ask you to commit to a minimum of 4 weekly or twice weekly sessions so you can really start seeing and feeling the results. Generally clients want a better understanding of their nutritional needs. When you book your first block of sessions we will email you our ‘Eating for Life’ nutritional booklet which will give you ideas to consider and include in your own daily diet. In addition we have a comprehensive cook book of healthy, balanced recipes that we will send to you on email. Beyond that we can provide a full dietary review of your current dietary habits to make sure you move in the right direction. Whether you want to know how to get the best from your nutrition, eat for wellbeing or sports we can help. We don’t advocate fad diets that are impossible to maintain or sustain. We encourage lifestyle adaptations that are manageable. give us one hour of your time and we will inspire you on your journey to improved fitness. Oh and show you it can be fun too!